I spent the entire first day at the Florida Audio Expo trying to get a sense of the acoustics in the basic listening rooms of the Embassy Suites by Hilton at Tampa Airport. At times, just when I’d begun to think that the faults with one system had more to do with room acoustics than anything else, I’d walk into another, totally untreated suite and discover that the sound was superb. So it was with more than a bit of lingering confusion that I continued my discoveries on the first morning and afternoon. 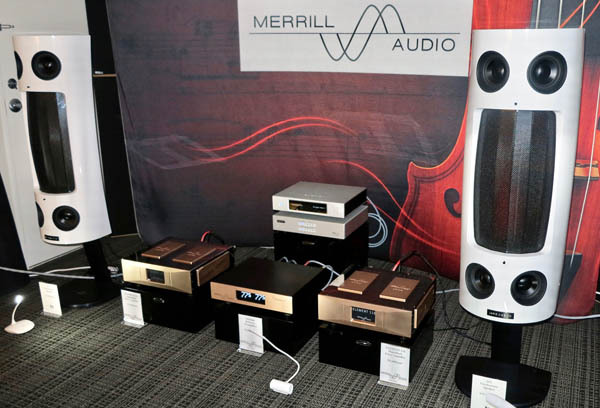 Next up, on the 8th floor, was the room jointly sponsored by Merrill Audio and Muraudio. Anne Sophie Mutter’s performance of Korngold’s Violin Concerto with the London Symphony Orchestra sounded very smooth indeed, with a lovely sweet and warm sound to the solo violin. That warmth carried over to the Oscar Peterson Trio’s version of “You Look Good to Me,” albeit, IMHO, with sound that lacked sufficient weight and ultimate focus. Heard: Muraudio Electrostatic speakers ($15,000/pair); Merrill Audio’s Element 116 monoblock amplifiers ($22,000/pair) with Gallium Nitride transistors and zero feedback, Christine Reference preamplifier ($12,400), and ANAP cabling; and Aurender N10 music server ($8000), with EMM Labs DAC2X ($15,500) and GIK room treatments. Pro-Ject assembled an under-$10,000 system (as in $9825 plus tax) that was difficult to appreciate fully given the combination of chatter in the room and an aggressive air conditioning vent located right next to one of the speakers. In addition, Pro-Ject was handicapped by the destruction of their RPM-9 Carbon turntable during shipping. What I can say with certainty is that, in this room, an LP reissue of DG’s 1971 recording of Beethoven’s Symphony 6, performed by the Vienna Philharmonic under Herbert von Karajan, sounded exceptionally smooth but a bit opaque. Doing the honors: Pro-Ject 6Perspex SB turntable ($1799) with Sumiko Songbird cartridge ($899, with a $400 discount for being bundled with this turntable); Pro-Ject’s Tube Box DS2 phono preamp ($799), Pre Box DS2 Analog preamp ($549), and Amp Box RS Stereo ($1299); Sonus Faber’s Sonetto II speakers ($2300/pair) and Sonetto II stands ($500); Pro-Ject’s Stream Box S2 Ultra (849), Pre Box S2 Digital ($399), and Connect it cables ($345); Pangea Vulcan turntable rack ($199); AudioQuest Rocket 33 speaker cable ($200); and assorted lights and stuff ($88). Note that the room also included a record cleaner, which Pro-Ject considers a “critical component” of any analog system. 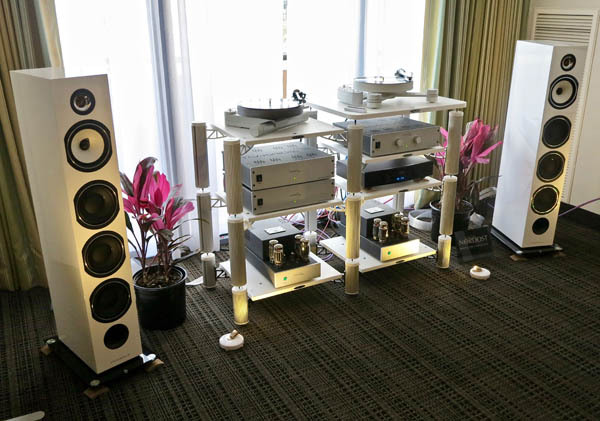 The Antal Audio Group put together an intriguing international system that included French Triangle Australe EZ speakers ($4000-$4500/pair, depending on finish), Greek Tsakiridis Devices’ Apollon 150W monoblocks with KT120 and 12AT7 tubes ($3995), Thalia line preamp ($1295), and Zeus MM/MC hybrid phono preamp ($1495). With a Soulines turntable and Nordost Norse series cabling, the sound was nice, fast, clean and strong on “Nightshift” by the Commodores, and a 24/352.8 MQA file of pianist Enrique Bagoria. 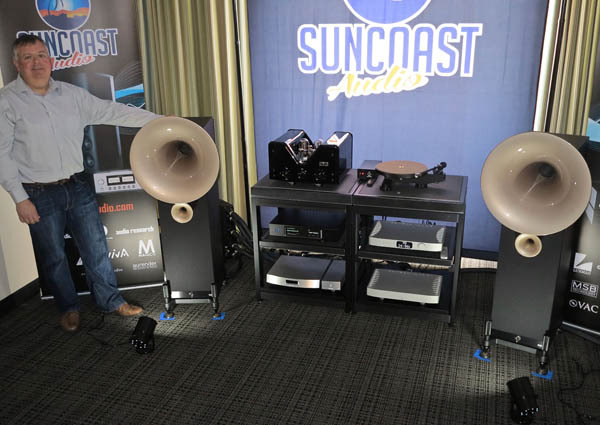 Michael Bovaird, proprietor of Suncoast Audio and one of the sponsors of the Florida Audio Expo, occupied two exhibit suites at the show. The first was dominated by Avantgarde Uno Fino XD speakers (which you’d think would cost more than $24,800/pair, given their fancy name). 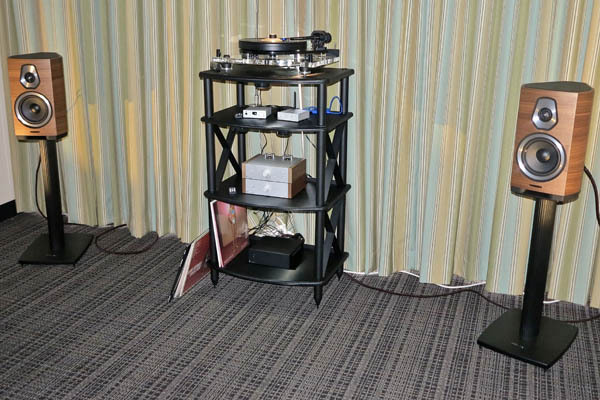 Also featured were the Viva Classico 300B integrated amplifier, in its premiere ($16,000), MSB Premier DAC ($35,535 as shown) fed by Aurender N10 music server, Avid Ingenium Plug & Play turntable ($1699 with arm and cartridge) and Pella phono stage ($1259), Shunyata Denali 6000T power distributor ($4995) and Shunyata Sigma cabling, and Critical Mass Sotto Voce stand ($6500 as shown) and Critical Mass Center Stage 2 feet ($960/four). The system exhibited natural timbres on an MQA file of Haydn’s Sonata 47, and lovely and warm sound on Cheryl Wheeler’s “Walk Around Downtown.” Wheeler’s low voice sounded exceptionally fine, and the guitar sounded natural, with fine tang. That said, some of the accompaniment really seemed to spread unnaturally behind Wheeler’s voice, and there were some bass control issues. I almost didn’t recognize the MQA track of James Taylor’s classic “He’s Got a Friend.” Was it because it was a later version, when the voice had grown a bit lighter than I was accustomed to, and the accompaniment often dominated? I really don’t know. What I was certain of, by the time I got to an MQA file of Bob Dylan’s original “Don’t Think Twice, It’s Alright,” was that the system’s somewhat warm coloration especially flattered the all-crucial midrange. 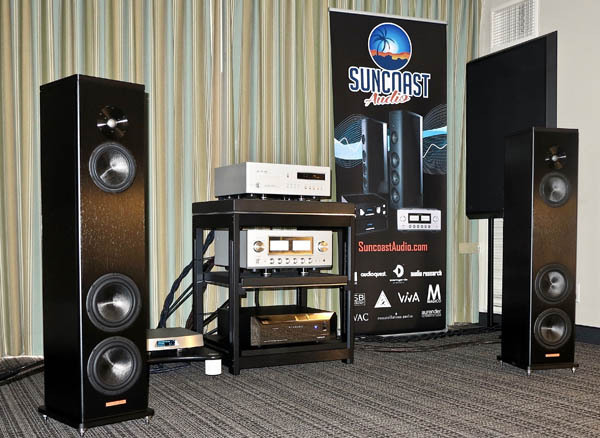 The sound in Suncoast Audio’s other room, headlined by Magico A3 speakers ($12,300/pair) and Luxman electronics-Luxman’s 590x integrated amplifier ($9495) and D-08u CD/SACD player/DAC ($14995)-was smooth, mellow, and beautifully controlled. That’s another way of saying that it rose to an entirely different level. I really grooved through Mary Stallings’s “A Sunday Kinda Love,” from her Live at the Village Vanguard album. A Steinway CD of a pianist whose name I failed to catch playing someone or other’s Carmen Fantasie sounded exceptionally atmospheric, warm, smooth, and just a little opaque. Trying to figure out what was going on, I offered up two discs from my own collection. Midrange and highs were strong on a track from Yarlung Records’ Antonio Lysy at the Broad, but the cello seemed a little thin. Nor did soprano Carolyn Sampson’s voice truly bloom on her SACD of Fauré’s Les Roses d’Ispahan. Despite wanting a bit more meat on those bones, it was the nicest sound I had heard so far at the show.